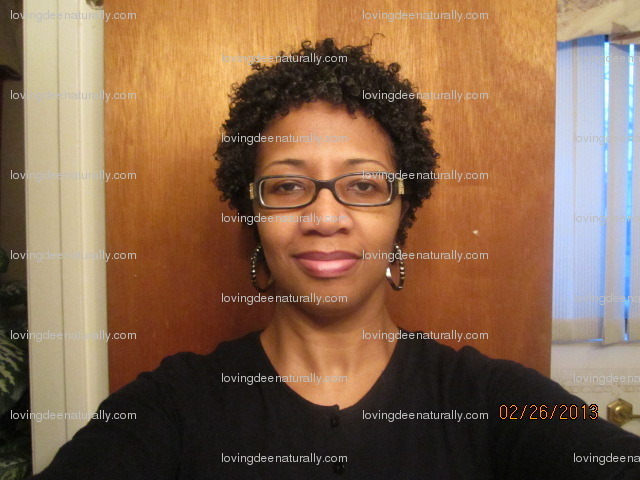 Loving Dee Naturally : This week's HOTD and TC journey ""
I think that I am done with the Tightly Curly Method Challenge that I was on. I was suppose to go three months with the challenge but it didn't take long for my hair to take to this method and it didn't take long for me to learn this method and apply it to my hair and it didn't take me long to become convinced that TC method is for me!!! So I think my goals were met and in a later post I will give my summations on what I think about this method. Special shoutout goes to Farah at www.aucurlsnaturelle.net for creating this challenge and inspiring me to experiment with different techniques and methods in learning/caring for my hair. I was overdue for a cleanse and condition. I try to do it every week. I should have done my hair this past Friday or Saturday but I just didn't feel like it. My hair was presentable and decent to go out. My curls were intact, very shrunken/tight to my head and frizzy. They were frizzy b/c I kept playing in my hair. I normally try to prevent frizz b/c I don't like nor want frizzy hair BUT this past week, I didn't care!!! Isn't it nice to just not care about being so nit picky about every strand of hair being in it's proper place??? It is just sooooo nice sometimes to just let your hair "do what it do" and "be what it be" and be completely satisfied with it!!!! I absolutely LOOOVVVVEEEEEE the versatility of natural hair!!!! If I feel like more body and some frizz, I can rock it!!! If I feel like more defined curls, I can rock it!!!! If I want to wear twists/twistouts, I can rock it!!!!! 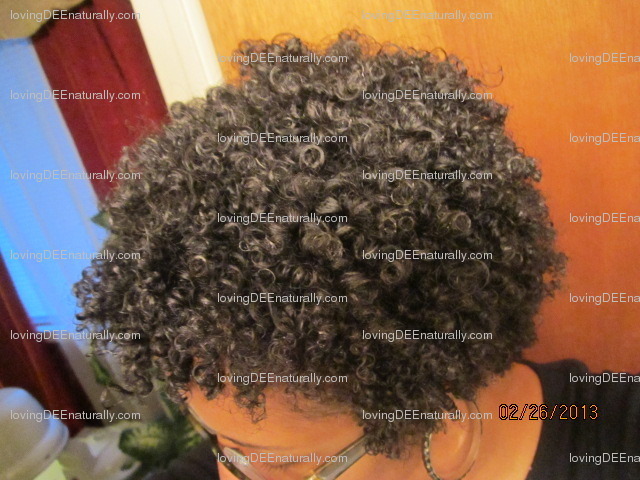 I started this process in the late afternoon b/c I wanted to do a "winter"(overnight) wash and go and let my leave-in penetrate my hair and condition curls throughout the night. 1. Condition/Wash/Condition - I thoroughly wet my hair and applied Suave Naturals Coconut Conditioner to all of my hair until my hair was coated. I then put a small bit of shampoo on my fingertips only and shampooed and massaged my scalp only, ONCE. I rinsed my hair completely. I then applied my deep conditioner(various conditioners and deep conditioner mixed with olive oil and stirred until smooth and creamy) and sat under the heating cap for 30 minutes. 2. 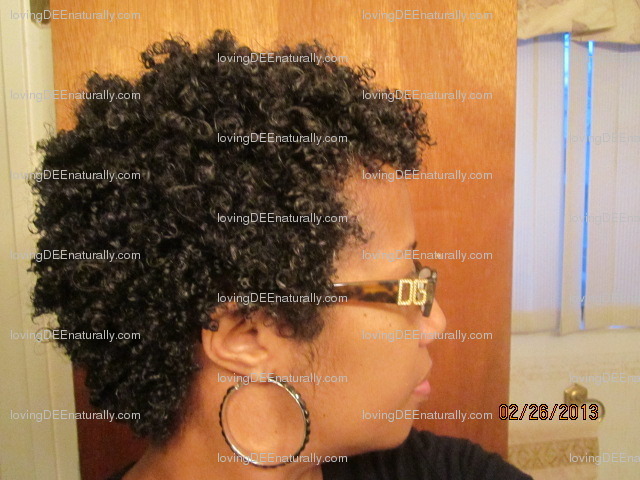 I rinsed the deep conditioner from my hair and applied Tresemme Naturals as my moisturizing conditioner and let it sit. 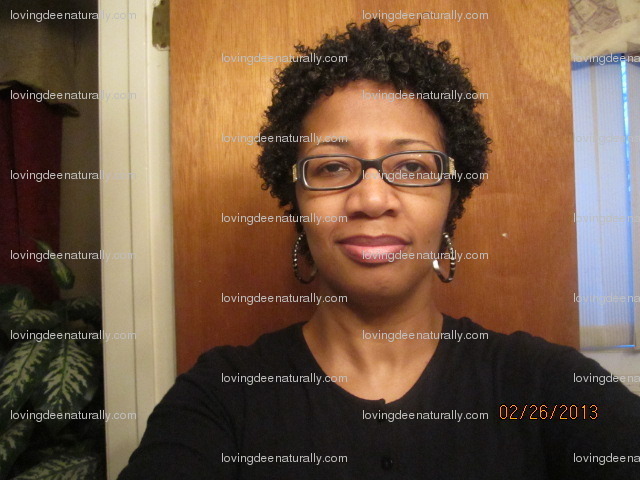 Once my hair began to soften I sectioned my hair and began to smooth and rake and detangle. I did not rinse all the conditioner out of my hair. I rinsed most of it out but wanted to leave some in. I shook my hair so the curls would clump and separate. 3. I then applied my leave-in conditioner(Tresemme+Tigi+SheaMoisture Restorative....this is the second time I'm using this combination and I'm loving it!! I added the SheaMoisture b/c I think it adds more weight to my conditioner and my hair rather than just jojoba oil). After applying my leave-in to all of my hair I took medium sections of hair and did a more intense smooth/rake/detangle on each section and twisted each conditioned section. I had about 20-25 twists all over my head..similar to this. I let my twists air dry until about 1 hour before bed....yes my hair was still very wet with conditioner...not dripping with water but heavy and wet with conditioner. I then put on a plastic cap and tied it all up with my satin wrap and went to bed. 4. This morning my hair was still wet with conditioner and sooooffffftttttttt with all that conditioner able to soak into my hair overnight. 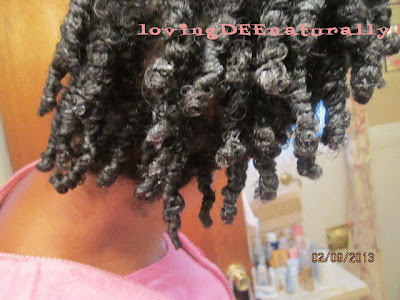 I did not let my hair dry in twists b/c my goal was not to do a twistout but a wash and go elongated by twists. 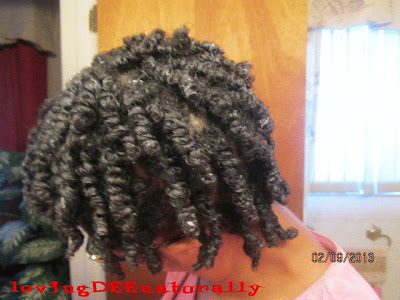 I took each twist apart and separated the curls that had clumped. 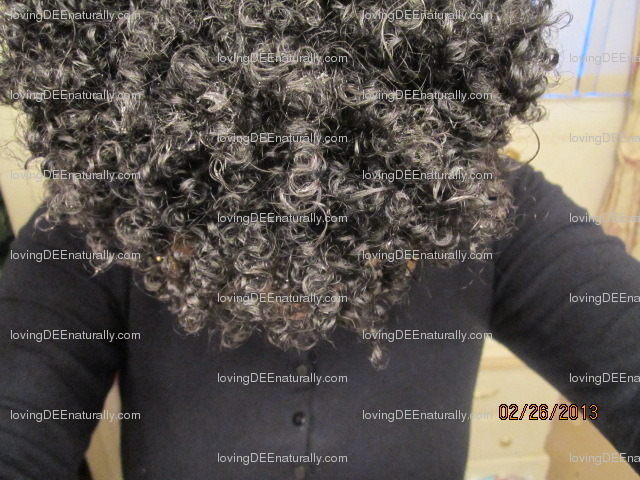 I even did some light smoothing and raking in areas where my hair had begun to dry in order to get the frizz out and bring back the curl, especially on some of my ends. After taking out all twists and separating my conditioned curls I gave it a good shake back and forth, up and down. I let my curls air dry across the day. I did initially sit under the hooded dryer until my scalp felt dry and then air-dried the rest of the day. This is the result. I absolutely LOVE the fullness that I have with this method/look. I find the TC method gives me VERY defined curls(which I love) but not much length. 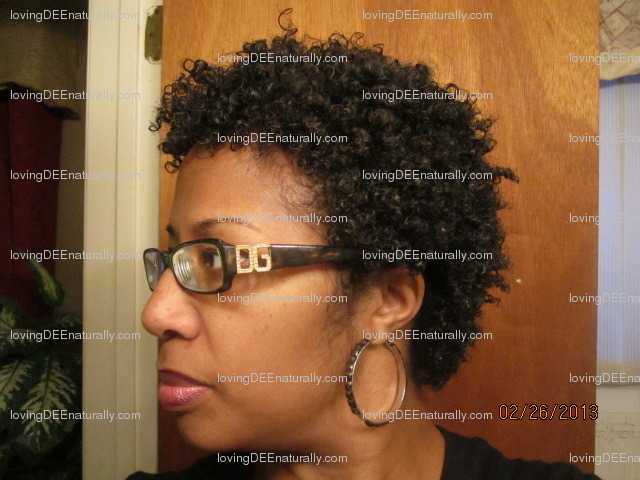 I have a lot of shrinkage with the TC method which is okay when I'm in the mood for a really defined look. But sometimes I like to have more fullness with minimal frizz. This is what I have with this hotd!! I also LOVE how I do have a little more 'length' with this method of letting my hair dry a bit in twists which I believe gave me some elongation. As my hair dried I could see some curls /areas that were frizzy at the ends or were too thick and curls had not separated. I just smoothed those few curls with a little water and condish, separated the curls and twirled around my finger if needed. 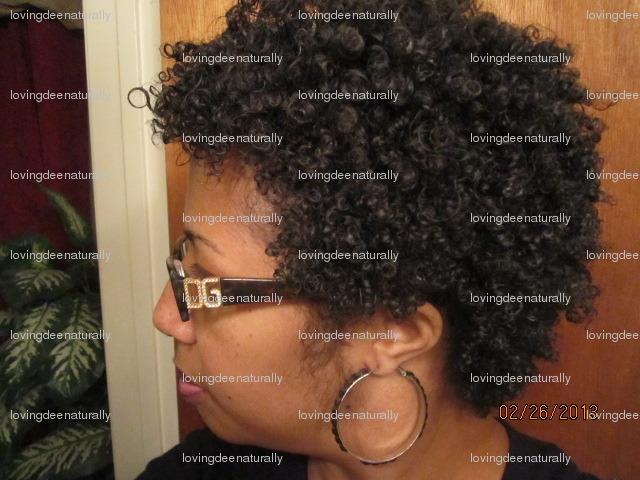 Yea shrinkage can be a beast!! LOL!!!! There are times I don't mind...other times I want some length. Girlfriend my hair is growing all by itself!! LOL!!!! I do my hair each week and this week when I cleansed my hair and the water ran over my hair in the shower I felt hair all on the back of my neck and my ears and face and I was like "when did THIS happen?". Like I said I do my hair every week but it seems like I skipped at least 2-3 weeks by the amount of growth from the last time I did my hair(which was only 8 days from this last wash day). I'm lovin' it!!! TC Challenge Week 6 Curl Love!!! !